Last week, NPQ reported on a standoff in British Columbia between a First Nations tribe called the Wet’suwet’en and the Royal Canadian Mounted Police (RCMP). RCMP says they were merely enforcing an injunction from a Canadian supreme court, but they arrested 14 First Nations people who were asserting their right to control their own land. This week, the Wet’suwet’en have been calling on other First Nations and their allies to stand in solidarity and support their story against the dominant narrative being pushed by the Canadian government, RCMP, and the oil and gas companies. Much like the protest at Standing Rock a couple of years ago—or the Kanesatake standoff near Montréal decades before—the Wet’suwet’en protest is seen as emblematic of the struggle between indigenous groups and settler colonial governments. The Wet’suwet’en never ceded their land to Canada and assert that they are merely living on their land and wish their government to be dealt with on equal terms. Canada’s government, meanwhile, under Justin Trudeau, has talked a lot about indigenous rights but has failed to make material progress toward a framework for respecting those rights. After the raid last week, the hereditary chiefs came to an agreement with the RCMP to avoid any further traumatic events, injuries, or arrests. 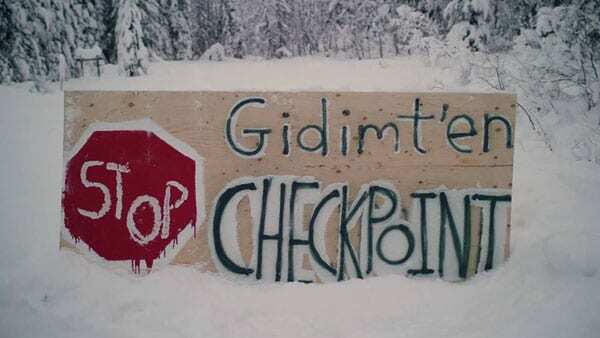 The Wet’suwet’en agreed to dismantle their checkpoint gate to allow workers into the area but maintain that they will not permit the pipeline to be built. “It’s very insulting, but it’s negotiations, a give and take. We need to look after our people. But there will be no construction, that must be made very clear,” said hereditary Chief Namok. Others have pointed out that agreement under fear or other coercive forces is hardly the start of real and respectful negotiations, but the chiefs have said that while they will not yield on the question of the pipeline, the safety of tribe members is paramount. Jennifer Wickham, a member of the Gidum’ten clan of Wet’suwet’en, explained that the RCMP weren’t even supposed to be removing the gate; according to the injunction, they were only supposed to keep the peace. However, she said, they attempted to move and dismantle the gate when they invaded the checkpoint and nearly broke the arms of defenders chained to the gate. Now, people posting on Facebook from the camp say the new agreement, reached under at least some degree of duress, is not being respected either. “That agreement, which dictates that all police exclusion zones will be lifted immediately and that our members will have free access to our territories, has already been violated by the RCMP,” wrote Julia Landry. Video shows tribe member Rita David arguing with police, saying, “You guys are invading our space…that’s just intimidating towards us.” David says she is being kept from the road in front of her home by RCMP’s enforcement of a work zone that was not part of the agreement. Mounties have been blocking the press from where the police are, saying “This is a worksite, so we can’t allow you here for your safety,” although there isn’t any work going on yet, per the agreement. More solidarity actions have been taking place across Canada and the US over the past week, including a non-indigenous group who blocked a pipeline in their area to protest the primacy of natural resource extraction companies.